Do you know about my massive crush on Werner Herzog? I freaking love the guy. If there was one person I dream of following around for a day, it would be Herzog. Stick me in front of a Herzog movie and I’ll be content for days. 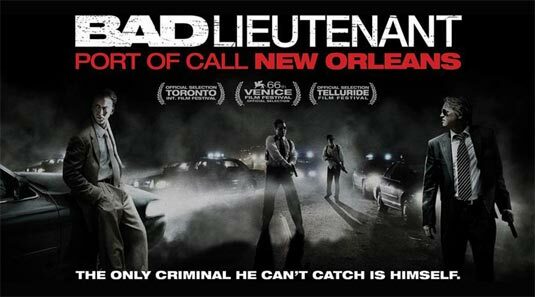 Bad Lieutenant: Port of Call New Orleans is a “rethought” (Herzog’s word) of Abel Ferrara’s Bad Lieutenant from 1992. Apparently Ferrara wasn’t took pleased with this rethought and the two directors exchanged some (rather hilarious) words in various interviews. Ferrara damned Herzog and company to hell while Herzog claimed to not know who Ferrara is. That latter comment is a head-scratcher but to be fair, I don’t think Herzog knows who anyone is unless he met them while staring into an abyss. Nicholas Cage steps into the role of the Lieutenant that was originated by Harvey Keitel in the 1992 movie. Okay, here is where I should admit that I have never seen Bad Lieutenant. I just wanted to watch the Herzog movie to watch the Herzog movie. I’m not a Nicholas Cage fan. I find it impossible to take him seriously in anything. I suppose that is why his character works in Bad Lieutenant; placing him in a Herzog movie is a great move. With Cage acting completely nuts, Bad Lieutenant: Port of Call New Orleans is the most ridiculous movie I have seen in a while. Totally worth my time.